HOW DOES SKIING ANDORRA STACK UP VS THE ALPS? It’s just gone 8am as I sit sipping a cappuccino outside a small café near the TSD 4 chairlift in El Tarter, Andorra, just over the road from the Hotel del Clos. The warm March sun beats down, strong even at this early hour at this point in the season, as the lift spins slowly around. It’s still not yet open properly, and the chairs are all empty, which means I have time to finish my coffee. Time for the sun to do its work too: I can see the snow is still solid following the overnight re-freeze, and I’d quite like it to soften up a bit and start the corn cycle before I go skiing. Sitting on the lift ten minutes later I look around; I can already tell it’s going to be a beautiful bluebird spring day. There’s plenty of snow – much more than at home in Austria – and I’m looking forward to making my first turns in Andorra. I’m curious, too: it’s my first trip to this little mountainous enclave, tucked away in the Pyrenees between France and Spain. I know it hosts a Freeride World Tour event. Actually I know it’s hosted consecutive FWT events, when there wasn’t enough snow in Chamonix and Fieberbrunn. Because I googled it I also know that the average altitude of Andorra is 1996m, which is pretty staggering when you think about it; a testament to the sheer number of mountains. And I’ve been told the ski resorts here are party towns, that the partying is better than the skiing, which is second fiddle to the Alps. 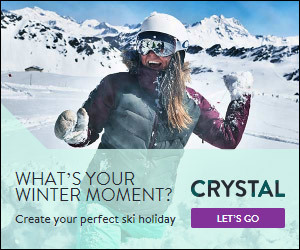 I’m curious because I suspect that isn’t the case: I’ve watched on wePowder.com as successive storms have battered the Pyrenees over the past couple of seasons while the Alps remained dry. Looking around as the lift whirs its way upwards, I can already see the off-piste potential. There’s swathes of terrain as far as the eye can see. But I’m swinging into the top station now. Time to find out for myself. 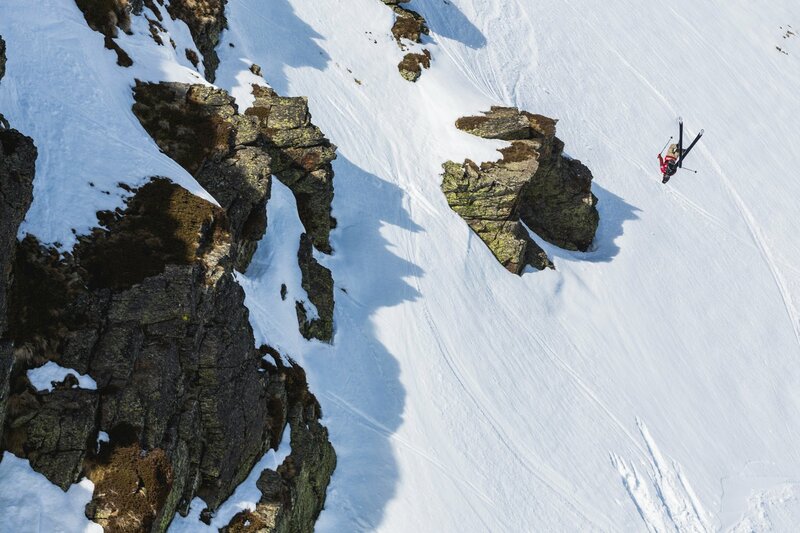 Catch the best action of the Swatch Freeride World Tour Vallnord-Arcalís! Enjoy 2 minutes of gnarly lines, huge drops and spectacular jumps. #DROPIN #FWT17 _ Discover all official videos of the Freeride World Tour and experience the passion of Freeriding through the one and only Freeride Competition Series of the planet. The fact is that Andorra does have a certain reputation as a budget ski destination for those can’t afford to go to the Alps, with a vague whiff of 18-30’s holidays about it. 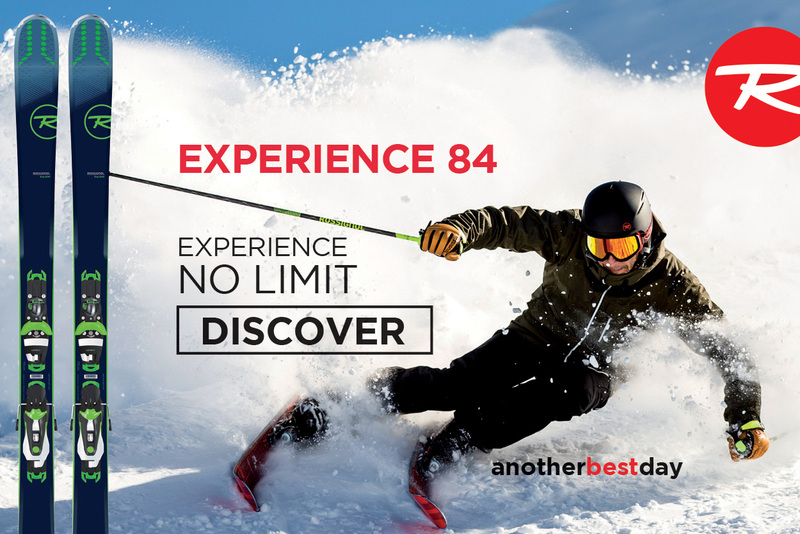 This reputation might once have been true – in some ways it still is, being much more wallet-friendly than the likes of Val d’Isere – but the real truth is that Andorra has some genuinely fantastic skiing with almost endless freeride terrain, uncrowded pistes, and a solid snow record. Largely responsible for this transition and the uptick in Andorran skiing is the resort – or rather resort partnership – of Grandvalira, formed in 2003 when the two sectors Pas de la Casa/Grau Roig and Soldeu/El Tarter/Canillo agreed to join forces and link up with a shared lift pass and infrastructure. It’s now one of the most successful resorts in the world, with 210km of pistes and approximately 1.7 million visitors a year. The lift system is staggeringly efficient, with 66 lifts capable of transporting over 100,000 skiers per hour; a feat matched by fewer than a dozen resorts globally. 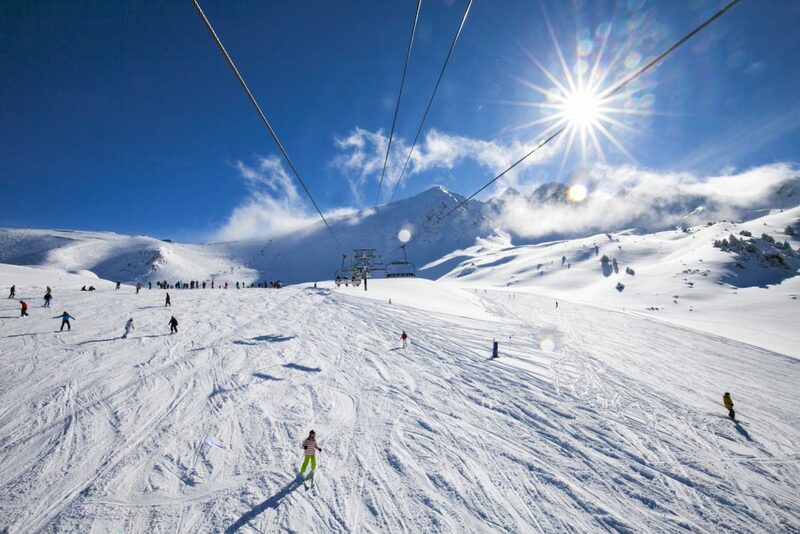 The majority of Grandvalira’s skiing is on blue and red pistes. For the most part they’re pretty cruisy, but long, and with plenty of variety – intermediate heaven. Wide open pitches invite you to let loose and hit the gas, before sweeping down into deliciously winding trails through the trees to the valley. The Avet black piste running right down to Soldeu is a real highlight: scene of multiple FIS races and scheduled to host a World Cup event in 2019, it’s one of the few real challenges on-piste and great fun to lap when it’s quiet. The terrain beyond the groomers is what will really have experts salivating though. Grandvalira has a number of marked and avalanche controlled off-piste routes and freeride areas, with plenty of scope to explore far beyond them too. Riba Escorxada and the Solanelles area are good places to start, but there’s a huge array of exciting lines within reach of the lifts and/or a short hike. The nearby – and day trip-able – resort and FWT venue Vallnord-Arcalis is an absolute treasure trove too. The terrain may not be quite as expansive as Grandvalira, but a playground of bowls, wind lips and cliff drops awaits adventurous skiers with a lot less competition for powder than the big names in the Alps. A quick look around is all it takes to find something interesting to ski. If anyone tries to tell you Andorra doesn’t have any tough skiing, they can take it up with Seth Morrison! 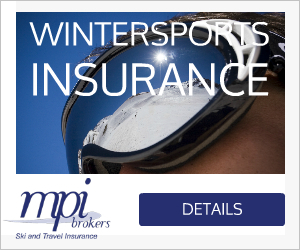 So yes – the skiing matches up to the Alps, certainly at least on par with resorts like Saalbach and the SkiWelt. By reputation at least the apres ski and nightlife is comparable too; the cuisine is delicious (calcots, a local speciality of grilled spring onions, are a must-try), and while the on-mountain food can err towards the pizza and chips side, a number of upmarket restaurants in the valley serve meals as good as you’ll find anywhere, with wine lists to die for to boot. Non-ski activities range from dog sledding to relaxation sessions in one of Europe’s largest spas and duty-free shopping. So what are we missing then? Why do so many British skiers write Andorra off as a poor alternative to the Alps? Honestly I don’t know. Maybe it’s all based on hearsay. But I’m not complaining: I for one will be back, in mid-winter when it’s cold and snowy. There’s a couloir I can still visualise in my mind’s eye – and I’ll be glad to not have to race the Skandi Army to first tracks in the powder. 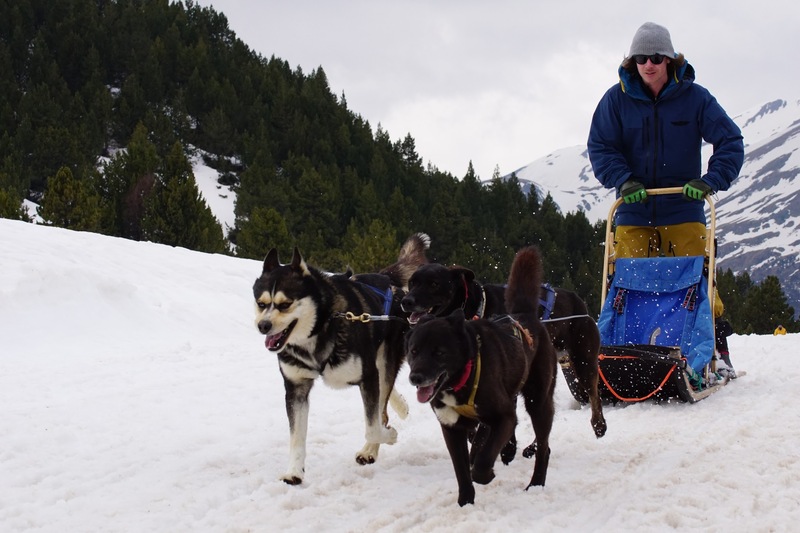 Matt might not have got to ski that couloir yet, but dog sledding certainly made up for it! 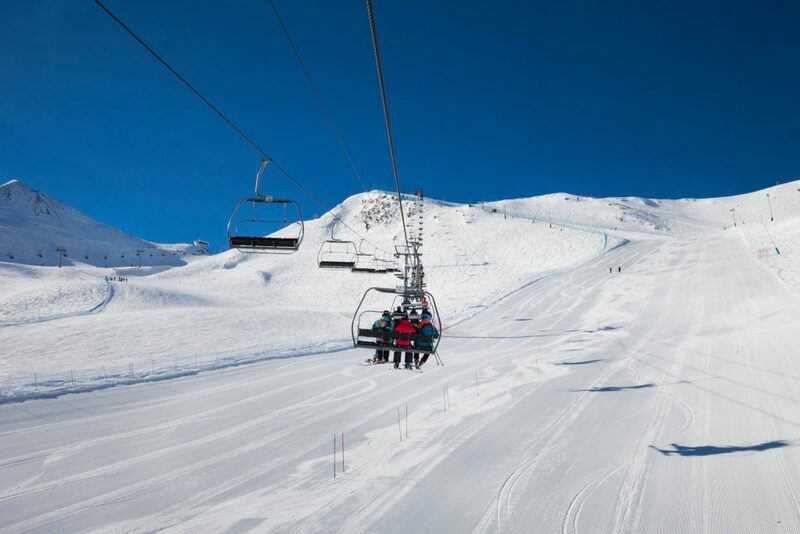 Over the summer news broke from Andorra that the highly successful Grandvalira ski resort is apparently set to break up at the end of the 2019/2020 season. The problem stems from complex local politics: currently the individual areas split income depending on which sector a skier begins their day, and a new free car park planned in Soldeu has upset the balance. If the split does go ahead, it will likely mean the currently fully-interlinked ski area would break down into its original parts – Pas de la Casa/Grau Roig and Soldeu/El Tarter/Canillo. However, there is no need to worry if you currently have a trip to Andorra booked as the resort will continue to operate as normal in the meantime. Where to stay: Neilson’s ***+ Hotel del Clos is 300m away from the lifts, with comfortable rooms and a lively cocktail bar. Where to eat: Llar De L Artesa Borda Popaire in Soldeu serves authentic Andorran meat dishes roasted over an open fire inside the atmospheric restaurant, plus other local delicacies.